At a time of war, when the public’s trust in a president worsens daily, when boys and girls come home weary and sick, or not at all, a little perspective—some ‘retrospective’—can ease the soul’s burden. 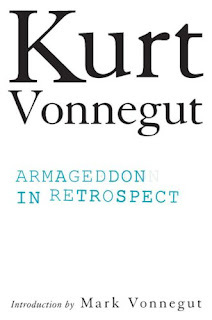 Published a year after the author’s death, Armageddon in Retrospect is a collection of Kurt Vonnegut’s previously unpublished works. An American soldier during the World War II years, Vonnegut grappled with notions about his country and its wars early in his life—and late, too. Some of that struggle shows through in this collection, which offers the reader a generous look at the short fictions which Vonnegut rearranged, stylized, and satirized within the landscapes of his imagination. As you follow along, through Medieval Europe, Dresden, and beyond, there are really great cross-sections of martial language and culture that parallel our current situation, suggesting that maybe we can learn from the past, after all.